This is absolute genius! Again, another comfort food turned low carb with tons of veggies. 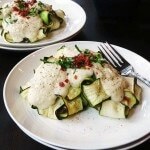 Zucchini Ravioli with Cauliflower “Alfredo” sauce. I wish I could take credit for this idea, but I cant. 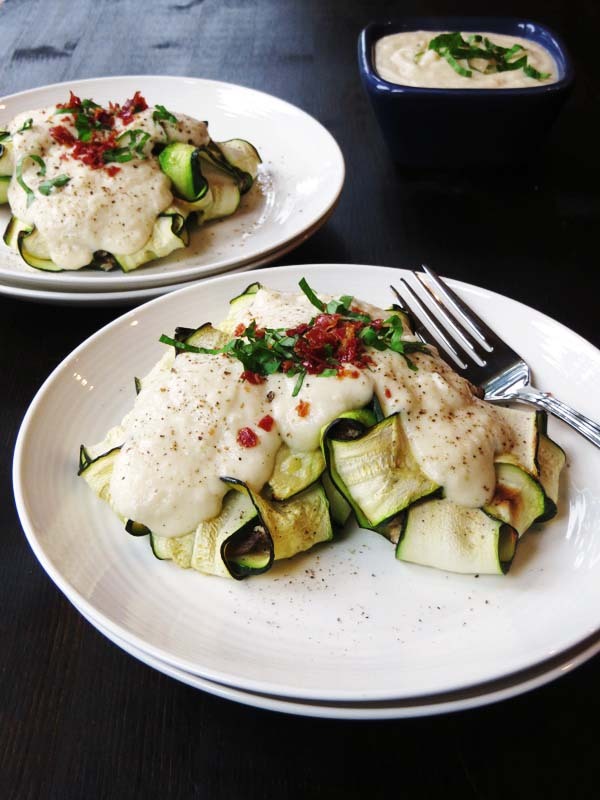 Sigh… I saw this fantastic idea for Zucchini Ravioli when a friend at work who follows the Paleo diet sent me a link to a blog called Cupcakes OMG where there was a recipe for Paleo “Ravioli”. I sent it to Debbie and we agreed we had to try it. If you’re wondering already, the Zucchini is sliced really thin and then folded around the ravioli filling. It really works and its very good! I had been looking for a great recipe to use this fantastic sauce that I found on Pinch of Yum’s site called Creamy Cauliflower Sauce. 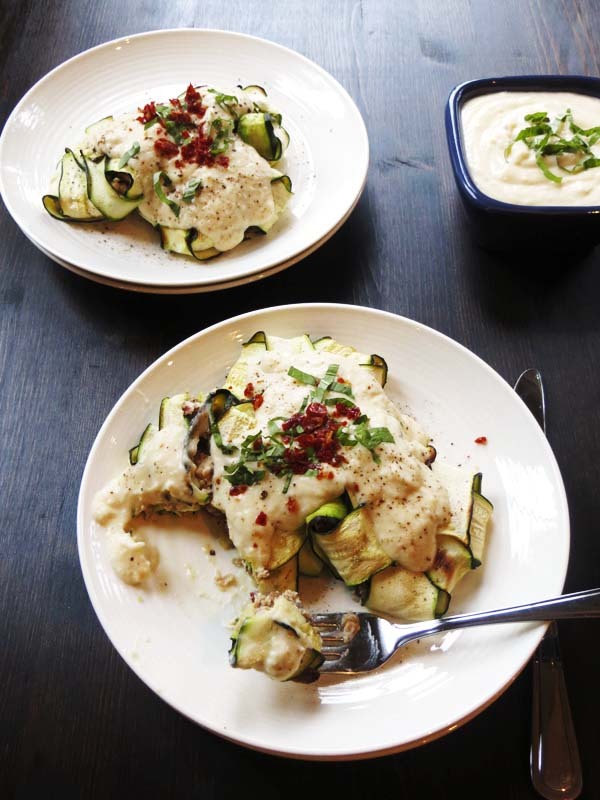 Its Cauliflower turned into a totally versatile white sauce that you can use in place of anywhere you would regularly use a cream sauce. Its super creamy and about a million times better for you than using heavy cream in your recipes. Did you know that Cauliflower is very high in vitamin C? It also is has a significant amount of vitamin K which is the hallmark of anti-inflammatory nutrients. On top of that, studies of diets for cancer prevention always include Cauliflower due to its anti-inflammatory and detoxification properties, as well as the fact that its packed with antioxidants. I had always heard that brightly colored vegetables are the best for you, so for the longest time, I left Cauliflower on the shelf. However, in the last while, I have learned that three white vegetables are actually some of the best defenders against cancer: Cauliflower, Onions, and Mushrooms. 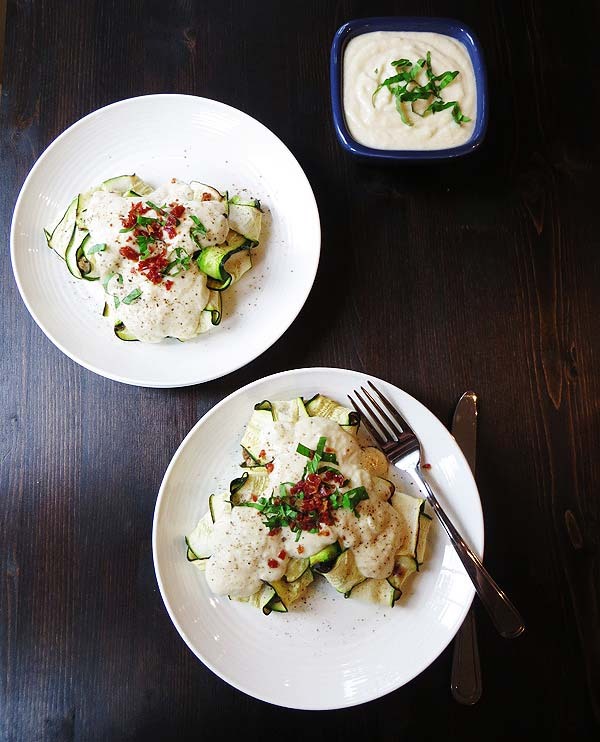 This sauce makes it super easy to incorporate Cauliflower into your diet often. I am very excited about this recipe, being on my low carb kick these days. I am also super excited to share this Cauliflower sauce recipe with one of my best girlfriends Liane. In the last 6 months she has jumped on my gluten free and almost dairy free bandwagon. We have spend countless hours lately talking about the evils of wheat and dairy and how much better we feel after cutting it out. Neither of us are able to totally cut out cheese, though I think she does a better job of it than I do lately 😉 Its hard! I love cheese! Anyways, I cant wait for her to try this gluten and dairy free (if you omit the cheese) white creamy sauce that you can use for so many recipes in place of dairy. Liane, I know your going to love this one….xo. Our Cauliflower sauce is a little different than Lindsay’s from Pinch of Yum, however the basics are the same. We just chose to add some onions to ours and this time, for the Ravioli, we added some cheese to it. I would suggest always adding the onions because I love the flavor they give, but the cheese is totally optional. We sometimes add it and sometimes leave it out. We made our Ravioli with a Chicken, Mushroom, Prosciutto mixture. You may have noticed by now that we kind of like Prosciutto. Its great because you only need a little bit for the flavor and its really thin, so its light on calories. Anyways, our filling is pretty much just those three ingredients. The Ravioli end up being a little big and you need to have some toothpicks on hand to secure the little bundles, but they are really easy to assemble. We found that its best to cook them on a broiler pan to let the liquid from the Zucchini drain as they cook rather than steaming or pan frying. If you are in the mood for some serious comfort food, but you still want to eat healthy and well, you have to try these! Get out a big pot and heat it on medium high heat. Cut the cauliflower in pieces place in the pot. Add onions, garlic, chicken broth and cover. Bring to a boil and cook till its very soft. Cool for about 15 minutes and put the cauliflower mixture in a blender and blend till smooth. You will most likely have to do it in 2 batches. After blending put it back in the pot and heat again. Add all the cheese and stir till melted. Cover the sauce and set it aside. Cut your chicken into thin strip and drizzle with olive oil, season with garlic powder, poultry seasoning, and pepper. Saute till cooked and remove from the pan. When the chicken is cool to the touch chop into tiny pieces, put into a bowl. Saute shallots and garlic cloves for 4 mins in the left over oil from the chicken. Scrape up all the chicken pieces left in the pan while cooking the shallot mixture. When shallots are tender place in bowl. Cook the prosciutto till crispy and break or cut into small pieces and add to the bowl. Take half of the mixture, put it into a food processor and blend till its a paste consistency. Then add to the rest of the chicken mix. Doing this will allow the mixture to hold together so it wont fall out of the ravioli. Take the zucchinis and cut them length wise about a 1/4 of an inch thick. A mandolin works really well. Take the 4 strip of zucchini, lie 2 strips vertical and the other to horizontal but do a basket weave over and under one time. 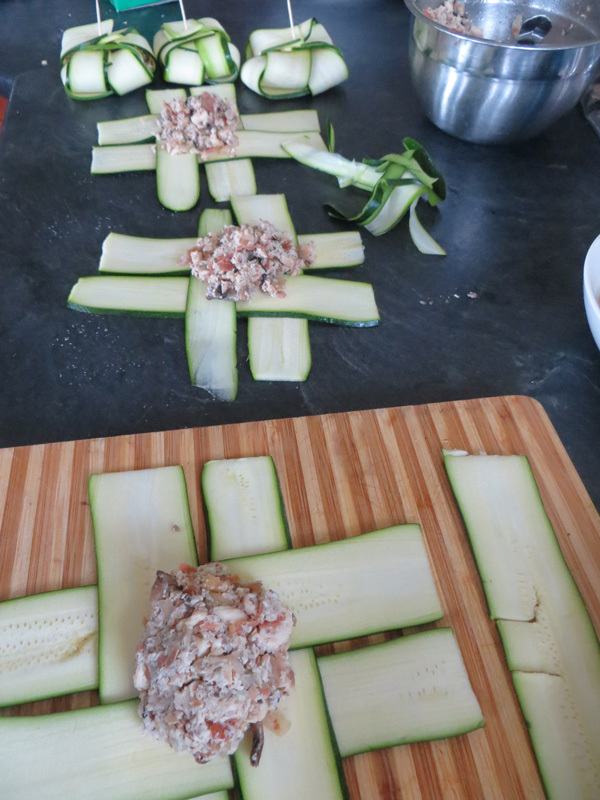 Then take about 1/4 of a cup of filling (give or take) and place it in the middle of the zucchini. Bring the end of the zucchini up to cover the filling. You will have to use toothpicks to keep it closed. Place ravioli on a broiler pan drizzle olive oil over the raviolis. Cook at 400 for 20-25 minutes till zucchini is tender. Place 2 or 3 ravioli on a plate and put a good dollop of the cauli-fredo sauce on each ravioli. Garnish with extra prosciutto or chives or whatever you like. As I mentioned before, this Cauliflower sauce is so versatile. Here we used it as a Ravioli sauce, but you could use it for Fettuccini Alfredo, or in Lasagna as your Béchamel sauce, or add a bunch of cheese and make Mac and Cheese with it. The possibilities really are endless. 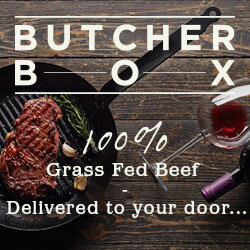 So much so that Lindsay from Pinch of Yum has created an eCookbook full of recipes on how to use this delicious sauce! Click here to find the Creamy Cauliflower Sauce eCookbook and get tons more ideas on how to use this sauce. Awesome! You will love it.